“I decided to change career at the age of 36. 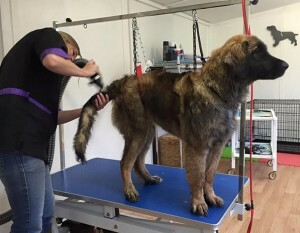 Knowing that I wanted to be a dog groomer I set out to find a college that could teach me both the practical as well as the theory of dog grooming. The College of Animal Welfare taught me both these. The teachers were fantastic with their knowledge and I found the practical learning side of the course was incredibly beneficial. The teachers understood that we were all learning and if we found anything difficult we were able to keep practising in that area until we were capable of doing a good job. On leaving the course we were all encouraged to call if we had any problems grooming which I thought was an added touch, it showed the College actually did care about its students and the well-being of the animals we would be working with. Since I left the College on July 2015 I have set up my own business; Petchase Dog Grooming and Walking Services based in Sandy. It has gone from strength to strength, so much so that we now have three people on the team! It was very daunting going out on my own and I must admit the first dog I did without encouragement of the teachers was rather scary… however, it is amazing how much knowledge you are taught and when the time comes you can put it into practice. I would like to thank the teachers at The College of Animal Welfare for their support with all the learning and practical lessons”.